What a beauty she is!! This is an antique Valentine’s Day postcard, featuring a stunning young woman. I love the red Rose in her hair! 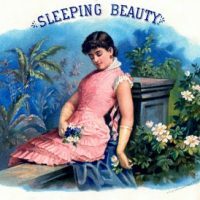 Antique Clip Art – Woman with Large Bird Hat Vintage Graphic – Sleeping Beauty 5 St Patrick’s Day Men Images! How many times a week does someone say “Karen! We love you!”? I bet it’s too many to count, considering the awesome images you’re always sharing (and that you’re a happily-married Mom, of course)! So, since it’s Monday, I’d like to start the chorus! Thank you so much for giving us the greatest graphics! She is truly a beauty, Karen. Thank you again (and again..and again..and again.. . . . . . . .
Just beautiful. You always give the best. Thank you. I have a good scan of a Maud Tousey Fangel pastel of a sleeping baby. 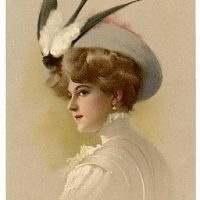 I’d love to send to you to share with everyone, but I have no idea how to find the date or if it’s still in copyright. If it’s something you’d be able to post, let me know! hrleonard (at) gmail (dot) com. I love looking in here. 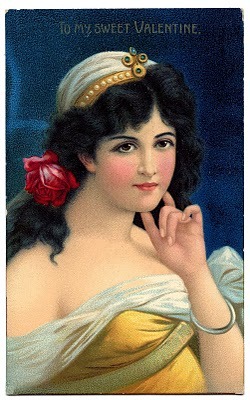 Beautiful… just found your Blog and the lovely shared free clip art images are amazing… this Gypsy Girl was perfect for what I needed to do today for tomorrow’s Post on my Blog, I will be linking the credit back to you so that other Artists can benefit from your amazing generosity … thank you, thank you, thank you! She looks just like someone I know!